add your logo, artwork & more! Design your custom USB drive in five simple steps and receive your order in a flash – we guarantee it! With over 40 years of trusted experience and a variety of printing options to brand your bulk order, SameDayFlash is your custom USB Flash Supplier, getting you exactly what you need, when you need it. Large or small bulk orders, engraved or printed flash drives in eye-catching designs, data loaded flash drives... no matter what you are looking for, our fast USB production and distribution is designed to meet your needs. At SameDayFlash, we developed a fast and efficient process to fulfill your custom flash drive order. You can get an estimate for your custom UBD drive order quickly with our simple five step process designed to get you the custom flash drives you need, when you need them. To complete our process, you just let us know your preferred 1) USB body style, 2) quantity, 3) storage capacity (some styles have up to 128 GB), 4) print option (one side, two side, no print) and 5) whether you want to preload any data like photos, PDF’s, presentations, etc. Once you have selected your body style, print type and storage capacity, just let us know when you need your bulk flash drives and any additional notes and we’ll get started fulfilling your custom order in a flash! 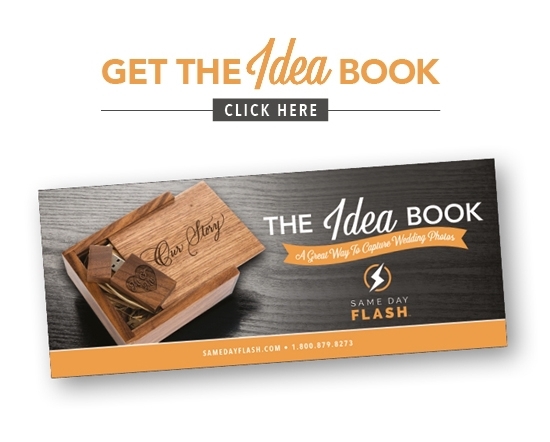 Whether it’s a branded order for your business clients or custom design gift for your wedding guests, every order SameDayFlash fulfills is backed with a total satisfaction guarantee. Your custom USB order will be complete on time, for the cost we quoted you and delivered to your satisfaction. Same Day Drives // Get your quote in 5 easy steps! From the minute you place your custom USB drive bulk order, we go to work! Whether your flash drives are printed digitally, laser engraved, pad printed, or data loaded, they will be designed and delivered to your exact specifications. Choose the body style that best fits your needs - custom branded snapcap or swivel flash drives or unique styles like sleek credit card, elegant wooden or our charming message in a bottle. No matter what style or specs you need, SameDayFlash is your custom USB Flash supplier! Are you a wedding photographer looking for an elegant way to deliver your photos? Download or request our idea book to explore some beautiful, unique USB storage options for your one-of-a-kind photos. Design your flash drives to beautifully store and preserve all the special moments from your or your clients’ big day! See what people are saying about our USB Flash Drives. Not only can we brand the look of your custom USB drives, but we can preload them with all your important content! Our high-powered equipment can load a high volume of flash drives quickly and have them formatted to your specifications. Pricing for data loaded USB flash drives will vary based on the size of the total data load per drive.